Gaceta Ilustrada, (Madrid) November 2, 1963. 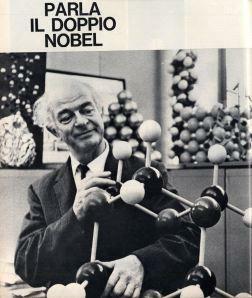 The controversy stirred up by the October 25th Life magazine editorial, “A Weird Insult from Norway,” which criticized the awarding of the Nobel Peace Prize for 1962 to Linus Pauling, continued throughout November as other publications began to weigh in. This notice of support was buttressed by another article in the same issue of The Nation written by Philip Siekevitz, a professor of Biochemistry at Rockefeller University. Titled “Scientists and the Public Weal,” Siekevitz’ piece emphasized scientists’ duty of social responsibility, a duty as important as the commitment to truth in the laboratory. Criticizing the attitude of some scientists regarding this obligation, Siekevitz wrote that scientists like Edward “Teller and Pauling are damned by their colleagues for their politicking not so much because of the side of the political fence each happens to be on, but simply because they talk about scientific matters in a political way.” By stepping out in this manner, Siekevitz argued that scientists could help balance the more destructive aspects of scientific progress that had been evident in the first half of the twentieth century. The European press picked up on the controversy as well. 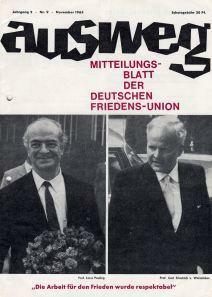 In West Germany, Das Gewissen - one of several media outlets in the country to comment on Pauling’s Nobel – explained to its readers how Pauling’s activism could be so controversial in America. 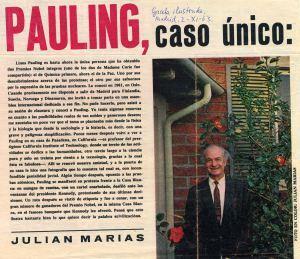 In Spain, Julian Marias wrote in the magazine Gaceta Illustrada that he harbored some reservations about Pauling’s activism, but was still supportive since Pauling had previously warned him about the harmful effects of nuclear fallout. Many others in the European press more simply announced Pauling’s win and impending travels. Individuals were also able to weigh in on the controversy as Life received several letters to the editor. Some, like Mrs. Norman Yves of Temple City, California, approved of Life’s stance, writing that she was “glad that LIFE had the courage and the integrity to inform the public of the real Linus Pauling” and congratulating its editors “for publishing the truth.” Others, like Robert F. Adam of Emporia, Kansas, appeared indifferent to the controversy, noting “I’m glad that I live in this country where a man can voice his opinion against policies of the government and can accept recognition for these opinions from another country” – not an option, he noted, available in communist countries. As you know, Life Magazine was guilty of an outright lie, in its perfectly clear statement, in its editorial on 25 October 1963, that I had demanded the uninspected stoppage of all nuclear tests. If you and your magazine had any standards of morality, you would have corrected and retracted this statement, and have apologized for it. All that your magazine has done is to make a statement of acquiescence to a correction in a letter from a correspondent, with an added quibbling statement apparently designed to confuse the reader. I registered a strong complaint with Henry Luce, and asked for a retraction. 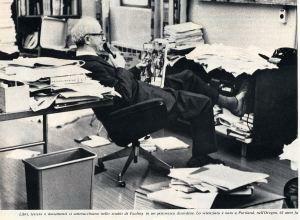 The retraction was made, in a grudging and quibbling way, in the letters to the editors section. I myself feel that the editorial involved a deliberate distortion – I would use even stronger words; but I am not sure that it would be worthwhile to file a libel suit. May I take this opportunity to express my pleasure at your receiving the Nobel Peace Prize and my admiration for your courageous and important work in alerting humanity to the dangers of nuclear testing. I might also say that for very good positive reasons, as well as to further increase Mr. Luce’s ludicrous frustration, I hope you will soon receive the Nobel Prize in Medicine. Surrounded by attention from the press, Pauling took the opportunity to conduct a few interviews despite his busy schedule. Reporter Arthur Herzog from the New York Times had approached Pauling about an interview for an upcoming article that would appear in the paper’s magazine in mid-December. Herzog requested that Pauling come to New York, but Pauling had to decline. To make things easier on Pauling, Herzog said he could come to Pasadena to interview him on November 12th and 13th. While Pauling agreed, he did so reluctantly. received a telegram from [Herzog] saying that the New York Times has rejected the article that it had commissioned him to do. I feel that the New York Times owes me an apology for having, through what seems to be misrepresentation, caused me needlessly to interrupt the very important work upon which I was engaged. I feel that it is important that the people of the United States have a newspaper upon which they can rely. My opinion of the New York Times is necessarily determined in considerable part by the actions of the New York Times with respect to me – that is, with respect to matters about which I have personal knowledge. I feel that I may be forced to make some seriously critical statements about the New York Times to the American people. is of course one of the world’s great chemist; and when his achievements in that field were recognized by the award of his first Nobel Prize some years ago, no one could have taken exception. That scientist was Dr. Pauling. His courage in running against the crowd is now being recognized. The letter must have been enough for Pauling as he made sure that his New York Times subscription would continue when he moved to Santa Barbara early the next year.